The Mixolydian mode, also called dominant scale, is the fifth mode of the major scale. The interval formula is root (1), second (2), major third (3), fourth (4), fifth (5), sixht (6) and minor seventh (b7). It has the same notes as the Ionian mode, except the minor seventh (b7), it is considered a major scale. The Mixolydian mode is widely used in jazz and blues music for improvising over dominant chords. It is one of the most important scale to know. 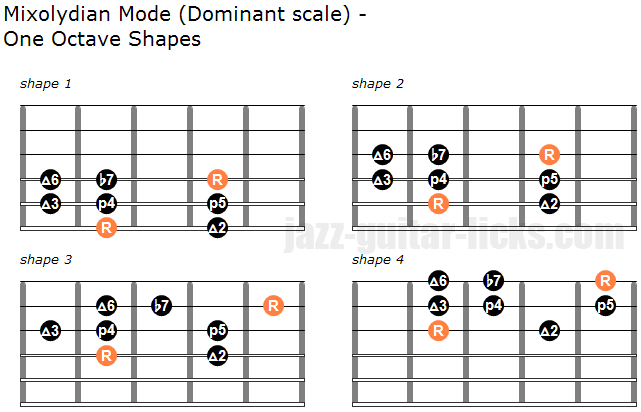 What is the Dominant scale? The Dominant scale is simply another name for the Mixolydian mode. It is called " dominant" because it is built from the 5th degree of the major scale also called "dominant". The Mixolydian mode can be used over any non-altered dominant chord as dom7, dom9, dom11, dom13, 7sus4. How to play the Mixolydian mode on guitar? Here are four one octave shapes that will help youy play the Dominant scale on guitar. The first neck diagram has roots on the 6th and 4th string. The second has roots on the fifth and third string. The third shape has roots on the fourth and second string and the fourth has roots on the third and first string. To understand and hear the Mixolydian mode, it is recommended to play these patterns starting from the root note (R). For example, to play the G Mixolydian mode with the 3rd shape you will need to put your second finger on the 4th string at the fifth fret. These two diagrams provides two shapes to play the Dominant scale within two octaves. Be sure to play these shapes in all twelve keys by moving the root note to the desired note while keeping the same intervals. The chart below represents the twelve Mixolydian modes to know. Any jazz guitar student must keep in mind that each mixolydian scale relates to a parent key. For example, the parent key of A Mixolydian is D, in other words, A Mixolydian is the fifth mode of D major. How To Build Chords From The Mixolydian Mode? There is only one difference between the Ionian and the Mixolydian mode, this is the minor seventh b7. The chart below shows you how to build a major triad, sixth and dominant 7th arpeggios from the Mixolydian mode. As you can see a major triad consists of a root (1), major third (3) and fifth (5). By adding the sixth (6) you get a sixth arpeggio. When adding the minor seventh to the same triad you get a dominant 7th arpeggio. Remember that an arpeggio is a chord whose notes are played one by one. How To Play The Upper-Structure of Dominant 7 Chords? Another technique used by many jazz musicians is to play the upper-structure of chords. This technique is to play any note in the chord above the seventh. Let's take the G7 chord (G-B-D-F) which is made up of a root (1), major third (3) perfect fifth (5) and minor seventh (b7). These notes are derived from the G Mixolydian mode. If you refer to chart above, the upper-structure of the G7 chord includes the ninth (A), the eleventh (C) and the thirteenth (E). It means that you can add these extensions to any dominant chord. This chart shows the extensions that can be applied to dominant seventh chords or dominant arpeggios. This easy example shows you how to apply extensions over a major II-V-I progression in the key of C. Indeed you can play the upper-structure of any type of chord. The first measure is based on the D Dorian mode (D-E-F-G-A-B-C), it starts with a minor seventh arpeggio (1-b3-5-b7) with the ninth (E) and the eleventh added (G). In the second bar you may notice three extended tones, the ninth (A), the eleventh (C) and the thirteenth (E) from the G Mixolydian scale (G-A-B-C-D-E-F).